After covering tech IPOs on Wall Street, Josh brought this experience to the other side of the table and founded two companies of his own. With users engaging for 51 minutes daily, video gaming is now more engaging than any social media outlet (Facebook, Snapchat, and Instagram). It's a top engagement digital platform globally. In 2017, the audience of esports will reach a total of roughly 385 million people globally. In 2016, The League of Legends Championship sold out the 15,000-seat Los Angeles' Staples Center in twelve minutes, and The International Dota 2 Championship sold out the 40,000-seat World Cup Stadium in Seoul while drawing an online audience of 27 million. Earlier this year, the Intel Extreme Masters tournament in Poland drew 173,000 fans over two weekends. 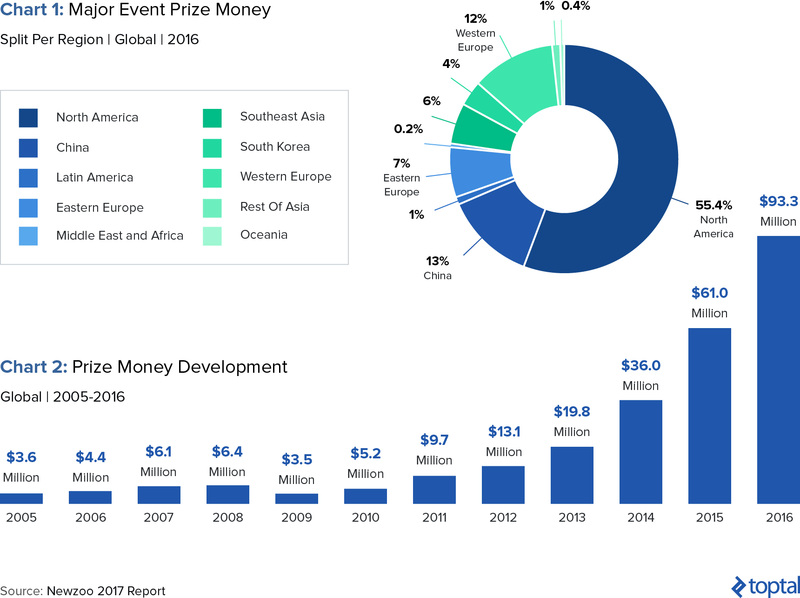 Total prize money in 2016 reached $93 million, up from $61 million in 2015 and a far cry from $5 million in 2010. The prize pool of the 2016 The International Dota 2 Championship was $20.8 million, an amount representing nearly double the payout of The Masters golf tournament. To rise through the ranks, players develop their skills through extensive, competitive play. Some even train up to 14 hours a day to hone quick reflexes and multi-tasking abilities. Successful pro gamers can earn six figure salaries or even millions in a year. Top players often start professionally around age 16 or 17, and then tend to retire around age 24. The upcoming year should see esports grow to ~$700 million in revenue, a growth of 41% from the previous year and an increase from $325 million in 2015. 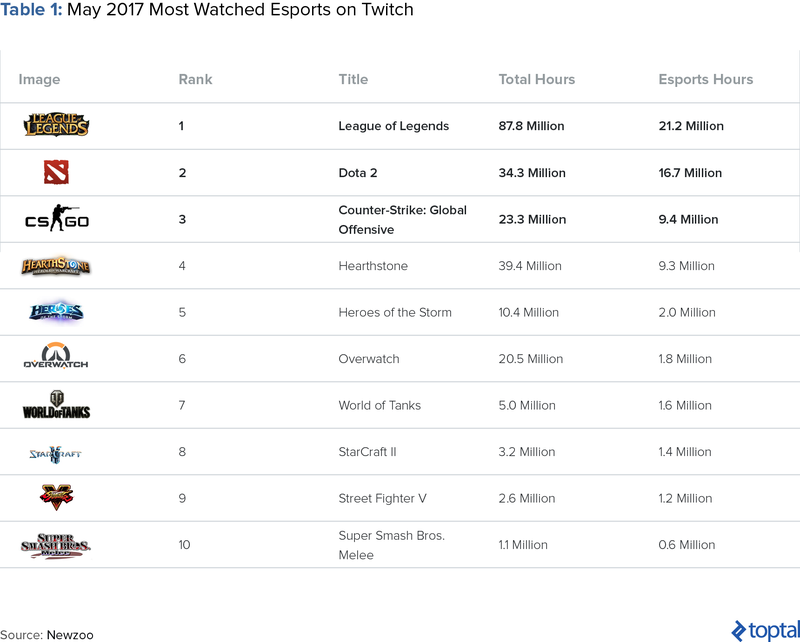 Twitch is one of the most popular streaming sites for esports. It was acquired by Amazon in 2014 for $970 million and reached close to 5 billion total hours streamed in 2016. A recent announcement from Riot on their League of Legends title has established a franchise model for the North American league. There will be ten spots, each with the hefty price tag of $10 million to buy in. YouTube has made its biggest investment into esports to date, signing an exclusive multi-year broadcasting deal with gaming platform Faceit. Sony is partnering with gaming tournament organizer ESL to power Sony Playstation Vue, a 24-hour TV network dedicated to esports. In May of this year, the NBA announced that seventeen of its teams will participate in the NBA 2k League, an esports league and joint project between the NBA and Take-Two Interactive Software. Until today, esports has been largely untouched by conventional investors. Its first major capital inflows actually came from the sporting world (Shaquille O'Neal, Alex Rodriguez, Mark Cuban, Jeremy Lin). Esports is a booming global industry where skilled video gamers play competitively. In the same way that traditional sports have competitions in baseball, basketball, and football, esports encompasses competitions across a variety of video games. Contrary to common perception, esports is not simply a phenomenon occurring in the basements of unemployed twentysomethings; the industry is real, growing globally, and investable. In fact, over 380 million people watch esports worldwide both online and in person. More people watched the 2016 world finals of popular esports game League of Legends (43 million viewers) than the NBA Finals Game 7 that year (31 million viewers). With its fragmented landscape and digital platform, the esports sector holds promise for a multitude of monetization opportunities. The following article will include an introduction to the industry as well as insights for those interested in investing in it. It will cover the parties involved in esports, the size and demographics of the audience, the industry dynamics, and how to approach investing in the space. I will provide not only third-party data and analysis, but also my personal experience and insight after listening to people, learning about the industry, and launching an esports company myself (Konvoy). Esports, short for “electronic sports,” transforms online gaming into a spectator sport. The experience is similar to watching a professional sporting event, except that instead of watching a physical event, spectators watch video gamers compete against each other in a virtual environment. If it’s hard to imagine why anyone would watch somebody else playing a video game, just think about how enjoyable it is to watch Lebron James or Steph Curry play basketball. Just as traditional sports fans enjoy watching top athletes perform at the top of their craft, the same is true of those who watch top video gamers compete. This industry includes not only traditional sports-related games like NBA2K and FIFA, but also—and more notably—games such as League of Legends, Counter-Strike, and Dota. As we’ll discuss later, individual players can either stream themselves playing to earn money or join larger organizations to compete for large cash prizes. The players can engage with their fans in a variety of ways including social media, live-streaming platforms, and in-person at tournaments. On the other side, fans can watch and follow their favorite teams compete in regional and global tournaments. Many technology platforms, services, events, analytics platforms, and substantial investor capital surrounds this ecosystem as it continues to grow. Esports is also unique in that a player’s success is independent of how tall, strong, thin, or fast they are. Though there is certainly valuable insight linking good physical health to enhanced gamer performance, it is ultimately inconsequential whether the gamer stands at 5’2 or 6’8 tall. They can both excel at the highest levels of League of Legends, CS:GO, Dota 2, or any other game. Esports can further level the playing field for factors such as gender, culture, and location. This democratization of participation contributes to esports’ allure and its generation of a globally engaged fan base. Additionally, whereas traditional sports have physical/spacial limitations, esports is more fast-paced and scalable because of its reliance on digital platforms. For example, it’d be impossible to make basketball a 100 versus 100 sport, as a court could not feasibly fit 200 players. In esports, however, new games with infinitely scalable dynamics, variances, and players can be created. In fact, a new installment of, or update to, an established game franchise can hold massive implications. For example, when 2013’s Call of Duty: Ghosts was released, players and viewers had to transition from the 2012 version by learning twelve new multiplayer maps. When updates are released to established games, it causes a massive learning curve as game dynamics and strategies can dramatically evolve. Which Esports Games Are Most Popular? Though the actual rankings of the most popular esports games change slightly month-to-month, the ten most watched games on dominant streaming site Twitch remain consistent (Table 1). As of right now, League of Legends remains the most-watched eSport in the world. It’s also worth noting, for those less familiar with esports, that the most popular games are not traditional sports-related video games such as Madden or FIFA. Rather, the popular esports genres include multiplayer online battle arenas (where a player controlling a single character in a team that must destroy the opposing team’s main building), real-time strategy (where a player builds an army to gain dominance over a map), or first-person shooter games (where players take part in a firefight across a map). The esports landscape is admittedly complex and at times difficult to navigate. The following section outlines the major parties involved in the industry. Streaming: Gamers who livestream themselves as they play video games are referred to as "streamers." This is typically done in casual play. While streaming can be incredibly profitable, many streamers have to decide whether they want to stream for a living or try and play professionally and run the risk of making less money. With that said, not all streamers have the skill to play professionally. Instead, some simply have "streaming personalities" that viewers find entertaining to follow, donate to, and subscribe to. This can create impressive revenue streams for the most successful. For example, the most popular YouTube channel in the world belongs to a video game streamer who goes by the name of "PewDiePie." He has such a polarizing style that viewers often find him either "highly delightful or incredibly annoying," and currently has close to 57 million YouTube subscribers. In 2015, he reportedly made $7.4 million. Playing Professionally: The few who rise to the professional level compete in tournaments all around the world against the best teams. During the journey, they usually build up a fan base for themselves as well as for the teams and organizations they play for (analogous to Lebron James having a following whether he's at the Heat or the Cavaliers). Successful pro gamers can earn six figure salaries or even millions. Top players often start professionally around age 16 or 17, and then tend to retire around age 24. Of course, there is variation across different games and publishers, but esports professionals generally start and end their careers much earlier than the average professional athlete. Retired esports professionals may opt to stream themselves, coach esports teams, start their own team, work for publishers, or finish their involvement with esports. Professional players join teams (in multi-player games) or play solo (in 1v1 games) to compete for cash prizes. Each team specializes and competes in one specific game, such as League of Legends, Dota, or Counter-Strike. The teams that compete at these tournaments have millions of followers on Twitter, millions watching online, and tens of thousands of spectators following them to in-person tournaments. A few examples include Evil Geniuses, Fnatic, and Optic Gaming. The best esports teams are recruited to be a part of organizations, have several teams that specialize in their respective video games but operate under the same name (e.g., Cloud9, NRG, TSM, Optic Gaming, or Fnatic)—just as an NCAA college or university competes in football, basketball, and hockey all under the same umbrella organization (the college or university). It’s helpful to think of an organization as an elite conglomerate of the teams playing a variety of video games. A few of the games are 1v1 while others are team based and involve two squads competing against each other. Leveraging a larger fan base following as the organization recruits more high profile players and teams, organizations will seek out sponsorships with brands to access additional revenue streams outside of cash prizes. These are determined by the following and successes of the underlying players and teams of that specific organization. Esports teams, representing the organization they’re a part of, will compete in their video game’s respective league where there are regular seasons, playoffs, and world championships. Just as basketball teams are part of the NBA and compete against each other, esports teams (typically under an organization umbrella) compete in video game leagues. League tournaments are run by companies such as Major League Gaming (MLG) or the Electronic Sports League (ESL). Leagues include North America League of Legends Championships Series, the Call of Duty World League (organized by MLG), or the Pro League for CS:GO (organized by ESL). When Major League Gaming first launched in the early 2000s, its tournaments drew dozens of fans. Today, esports’ largest tournaments are nearly as large as traditional sporting events. In 2016, The League of Legends Championship sold out the 15,000-seat Los Angeles’ Staples Center in an hour, then sold out the 40,000-seat World Cup Stadium in Seoul while drawing an online audience of 27 million. Earlier this year, the Intel Extreme Masters tournament, held in Katowice, Poland, drew 173,000 fans to the stadium over two weekends. Other popular global esports venues include London’s Wembley Arena (12,500 fans) and Seattle’s KeyArena (10,000 fans). Perhaps unsurprisingly, prize money for the largest tournaments can be enormous. Total prize money in 2016 reached $93.3 million, up from $61.0 million in 2015 and a far cry from $5.2 million in 2010. The prize pool of the 2016 The International Dota 2 Championship was $20.8 million, an amount representing nearly double the payout of The Masters. In esports, each game is the intellectual property of the game creator, collectively referred to as “publishers.” These publishers include Riot Games, Valve, Activision, and others. The publisher’s dynamic in the esports ecosystem can be considered “all powerful.” Unlike traditional sports, which can be played by whomever and wherever, publishers build and develop their games and subsequently own all rights surrounding them. This means that they have rights around where the game is played, who can host video game tournaments, and more. At the end of the day, publishers own the intellectual property of each game, and other industry participants (players, teams, tournament organizers) are keenly aware of this reality. During the summer of 2016, a few esports teams approached Riot Games, the publisher of esports’ popular game League of Legends, regarding new terms for revenue sharing and broadcasting rights. When negotiations failed and Riot declined the teams’ demands, publishers’ authority in the space was further underscored. However, in June of this year, Riot Games announced franchising and revenue sharing possibilities, which would allow for select players and teams to participate in the upside. This development will be discussed later in the “Upcoming Trends” section. Aspiring Pro Gamer and Fan Resources: Includes everything from news sources, industry statistics tracking, coaching, and skill improvement tools. Professional Gaming - Platforms and Infrastructure: Tournament platforms (e.g., Battlefy) and communication tools (e.g., Discord). 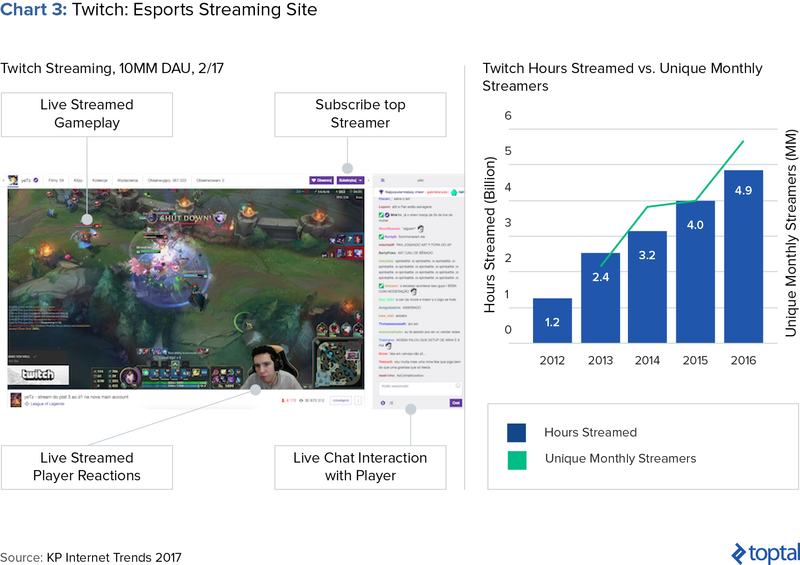 Livestreaming Resources: Streaming platforms, streaming services, game highlights, and esports analytics. In particular, Twitch is one of the most popular streaming sites for esports. It was acquired by Amazon in 2014 for $970 million and reached close to 5 billion total hours streamed in 2016 (Chart 3). Betting and Item Marketplaces: Esports gambling, fantasy (with pro-esports athletes), and item marketplaces for in-game customization. Esports to reach 385 million viewers in 2017: According to Newzoo, an esports market research organization, in 2017, the audience of esports will reach a total of roughly 385 million people globally. 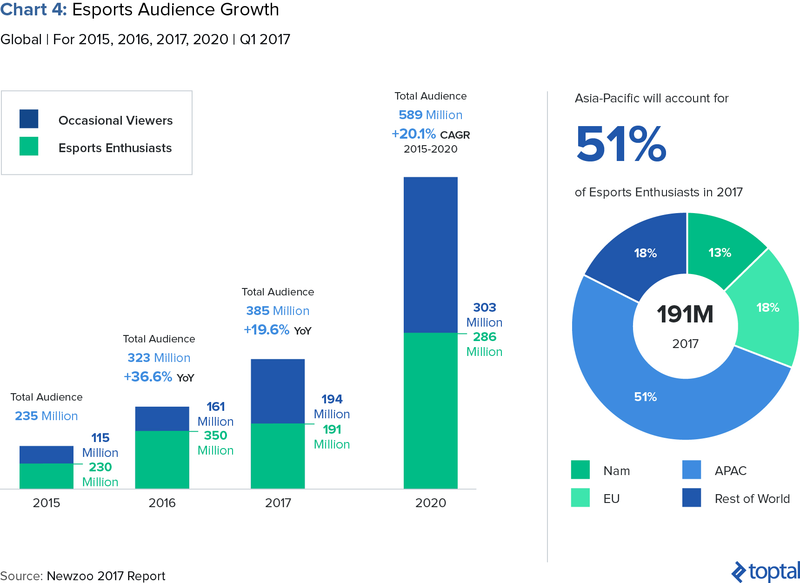 Of this figure, 191 million are “esports enthusiasts” and 194 million are “occasional viewers.” The number of enthusiasts is projected to grow by 50% by 2020, totaling 286 million (Chart 4). Most fans are in Asia, North America, and Europe: In the past, people thought that the craze of competitive video gaming was primarily an Asian phenomenon, yet today only 51% of esports enthusiasts are in Asia. In fact, North America and Europe have taken a prominent place in the global esports and gaming ecosystem (Chart 4). Fans are deeply engaged: Fans are already averaging 100 minutes per session spectating. Interestingly, only about half of viewers actually play the video game they are watching. Furthermore, 60% of esports fans are willing to travel to see their favorite games, tournaments, and players. Fans are young digital natives: Research indicates that 65% of fans are between the ages of 18-34, and, while the fan base does skew male, 38% of esports fans are women. 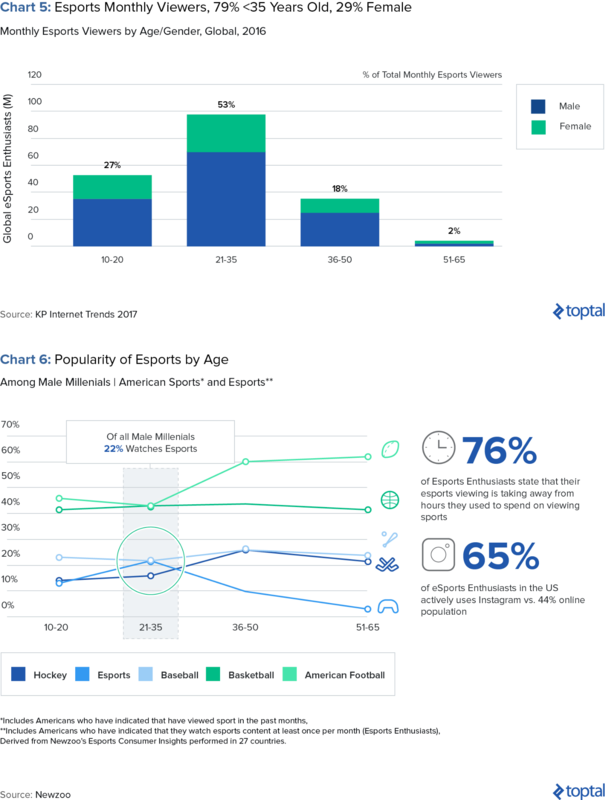 Among American male millennials (age 21 to 35), esports is just as popular as baseball or ice hockey, with 22% watching it. In North America, the most popular sport in the region, football, is only 2x as popular as esports among male millennials. For male viewers between the ages of 36 and 50, football is only 3x as popular. Esports fans are working professionals with purchasing power: Global marketing firm Mindshare found in a survey that 43% of esports enthusiastics have an annual household income of $75k per year or higher, and nearly one third (31%) have income of $90k or higher. This purchasing power and ability to engage on technology platforms makes the esports audience particularly desirable to target for big brands, which we will discuss later on. A decade ago, one-off sales of packaged home-console software comprised 64% of the global gaming market. Since then, it has fallen to 30%. With esports now included in the 2022 Asian Games, gaming companies can now start to develop similar revenue streams as media companies, including advertising, ticket sales, shares of TV rights and more. The upcoming year should see esports grow to ~$700 million, a growth of 41% from the previous year and an increase from $325 million in 2015. The 2017 figure does not include betting or fantasy esports numbers. Revenues are projected to reach $1.5 billion by 2020, growing at a CAGR (2015-2020) of 35.6%. Advertising comprises the revenue generated from the advertisements targeting esports viewers, including ads shown during livestreams on online platforms, on video-on-demand content of esports matches, or on esports TV. Brands ranging from Intel and Samsung to Coca-Cola, Arby’s, and Redbull are already targeting the esports audience—especially considering their significant buying power. Right now, advertising across esports’ many platforms remains much cheaper than doing so on more traditional sports. If the esports viewership and influence continues to expand, exposure to this fan base will get more expensive. Comprising 22% of the industry right now, advertising is one of the largest streams and is expected to grow to $224 million by 2020. The well-known gaming/tech esports sponsors are increasing their involvement and at the same time, lifestyle brands and non-endemic brands (brands not inherent to the gaming industry) are also moving from experimental to dedicated esports budgets. On top of that, local teams, leagues, and events are starting to tap into new marketing budgets to reach this audience. Currently, game publisher fees represent a large portion of the industry. Much of this capital has been an investment in marketing by game creators in order to extend the shelf life and relevancy of their games. According to Newzoo, game publisher fees will experience the slowest growth in the upcoming years. Merchandise and ticket revenue is money generated from the sale of merchandise and live tournaments. Media rights revenue is the revenue paid to industry stakeholders to secure the rights to show esports content on a channel. This includes payments from online streaming platforms to organizers for broadcasting their content. This also includes foreign broadcasters securing rights to show content in their country and paying for copyright to show video content or photos of esports competitions. In terms of pace, the fastest-growing revenue stream will likely be media rights, which will generate $340 million by 2020, up from $95 million this year. Exclusive content deals, as seen in traditional sports, will drive this growth. Franchising will become mainstream in North America. Similar to how the NFL, NBA, MLB, and NHL follow a franchise model with limited membership in their respective sports, esports in North America seems to be following a similar path. A recent announcement from Riot on their League of Legends title has established a franchise model for the North American league. There will be ten spots, each with the hefty price tag of $10 million to buy in. Activision’s title, Overwatch, is also in the process of franchising. In Europe, esports is likely going to follow a promotion and relegation model, given the region’s familiarity with that sporting system in groups like the UEFA Champions League. As franchising becomes the dominant model, elite teams and organizations will become revenue-generating machines. However, those without franchise spots will be forced to find revenue in secondary leagues or look to establish themselves in titles that have yet to be franchised. They won’t have access to sizeable revenue sharing deals in places like League of Legends and will have to focus on competing in secondary leagues, which offer far smaller cash prizes and sponsorship opportunities. While this consolidation will certainly be painful initially, I view this as a much-needed step forward for the industry as it continues to grow and prune the market. 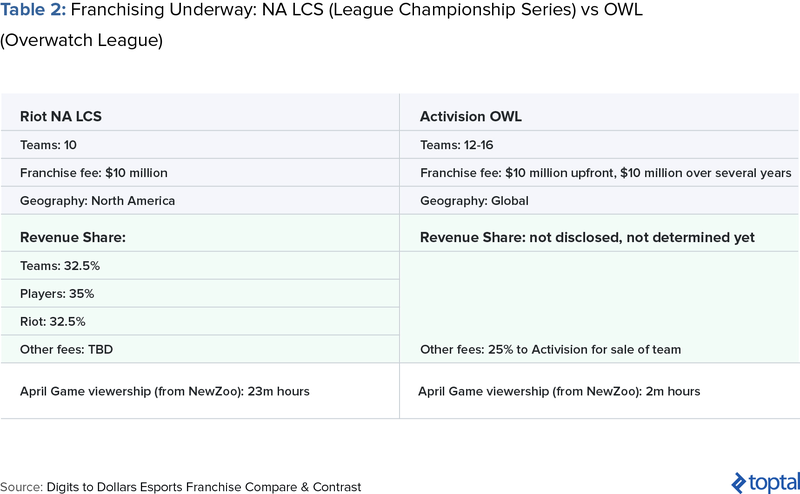 The below chart includes franchising details for the Riot and Overwatch leagues. Broadcasting and media rights will be a key growth driver. In esports, broadcasting and media rights will be a key growth driver as the worlds of media and gaming continue to converge. As mentioned previously, this sentiment is echoed in Newzoo research, which projects the media rights sector to grow from $95 million in 2016 to $340 million by 2020, making it the fastest growing portion of the esports market. Because publishers in esports own the intellectual property for each game they’ve created, they have the ultimate authority to set the terms by which other parties can utilize their software. This includes restrictions around which software licensees (members of the public, teams, league organizers) can play the game, permit others to play, and allow others to watch the game. Up until recently, publishers have been fairly relaxed about their restrictions. Seeking widespread user adoption and popularity, they’ve generally encouraged gamers to share their gameplay under their terms and conditions. However, the industry is now reaching a turning point where the adoption of games and of esports has exploded. Consequently, publishers are looking to capitalize on this audience and momentum by monetizing broadcasting and signing exclusive content deals. And, since players and organizations draw in these fans, they are seeking revenue share agreements with publishers. These new developments are catalysts for the emerging franchise models explained above, whereby teams, players, and publishers yield similar revenue splits. Looking ahead, publishers will selectively grant broadcasting rights to specific partners and media outlets. One key thing to watch is whether heightened control over streaming and viewing rights will cause fan and player pushback, since publishers have historically encouraged users to share and stream content at their own discretion. Virtual reality (VR) is overhyped. There’s a lot of buzz about VR as an industry, and specifically regarding its involvement in esports. However, I don’t believe mass audience adoption will occur within the next 5-10 years. It is true that virtual reality headsets are already being developed specifically for esports audiences. Some games such as Alien Isolation, in fact, already offer VR support, and other games such as EVE Valkyrie have been built specifically with VR in mind. Still, Alien Isolation and EVE Valkyrie have weak user bases, and VR technology possesses prohibitively high costs and is largely underdeveloped. For example, existing VR technology features often lack adequate interactive components. It will be interesting to see how the virtual reality and esports industries converge going forward, but widespread adoption is unlikely in the short term. Although now is a great time to invest in esports, many investors understandably find it challenging to navigate its complexity. Still, this complexity translates to a vast, broad range of investment opportunities. Exciting times undoubtedly lie ahead as these various verticals continue to develop monetization strategies for the massive audience base. One way to gain exposure to the esports sector is through public markets. Below is a list of publicly traded companies that have various connections to and investments in esports. 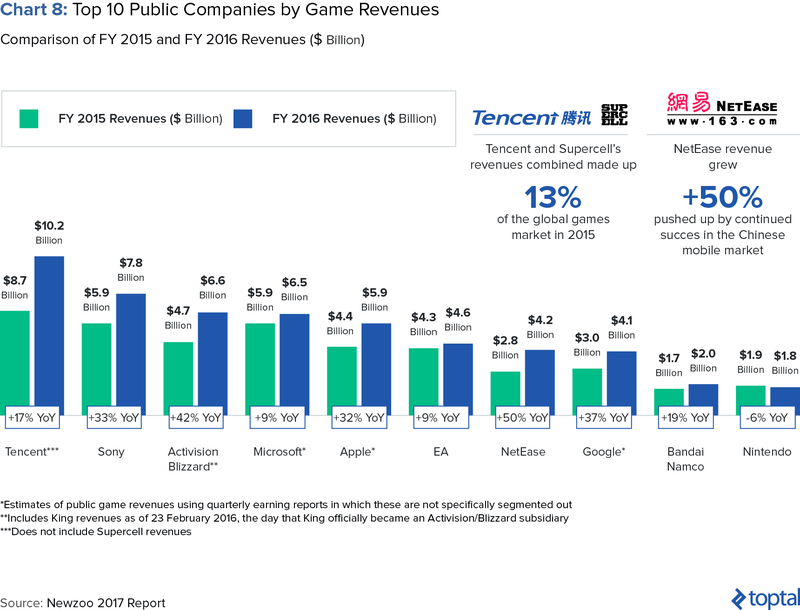 For example, Tencent owns Riot Games, creator of the most-played game League of Legends, while Activision Blizzard develops the popular games World of Warcraft, Overwatch, and Hearthstone. YouTube has made its biggest investment into esports to date, signing an exclusive multi-year broadcasting deal with gaming platform Faceit to stream the Faceit’s Esports Championship Series (ECS) pro gaming league. Sony is partnering with gaming tournament organizer ESL to power Sony Playstation Vue, a 24-hour TV network dedicated to esports. At this point, esports revenues only comprise a small percentage of the overall revenues of these public companies, so at this stage, public market investing is not the primary way to gain exposure to this space. The private markets are where most esports investments and activity have occurred. Investment sources are varied, including media companies, angel investors, sports celebrities, and professional sports teams, and more institutional sources of private capital such as venture capital funds. Nevertheless, despite growing interest from VC and angel investors, until today esports is an industry that has been largely untouched by conventional investors. Its first major capital inflows have actually come from the sporting world (Shaquille O’Neal and Alex Rodriguez, Mark Cuban, Rich Fox, and Jeremy Lin). In May of this year, the NBA announced that 17 of its teams will participate in the NBA 2k League, an esports league and joint project between the NBA and Take-Two Interactive Software. While VC and angel participation has begun to tick up, generally professional investors remain hesitant. In a newer industry, there are even more unknowns and risk than typical startup investing normally entails, and this is especially true with a space as unique as esports. Overall, though, I think the tide is starting to shift. Another concern that many venture capital and angel investors often voice pertains to deal volume. I’ve spoken with many who remain concerned with whether there is sufficient deal flow in the esports industry to justify investing their time and resources to learning and understanding the space. However, the data shows that there actually is substantial deal volume. 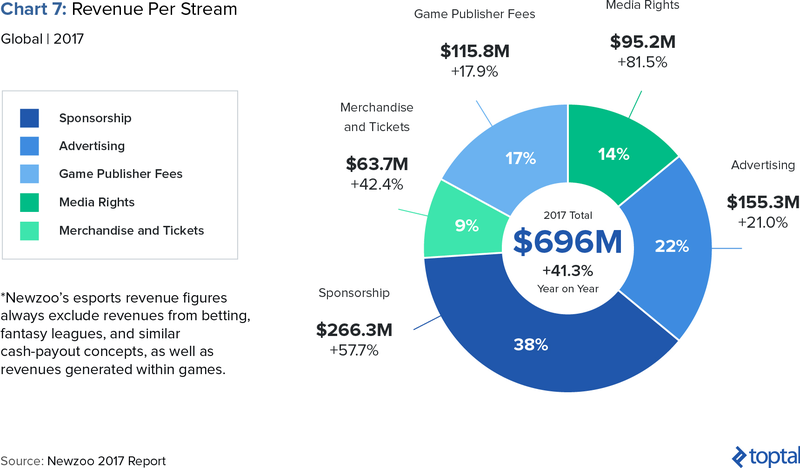 According to CB Insights, since the start of 2011, esports and game streaming startups have raised $714 million across more than 100 deals, and that’s only what CB Insights has tracked. On AngelList and Crunchbase, where startups self-list their companies, unique esports and video gaming startups comprise ~2k listings. Consider this figure in comparison to those in more established industries: Internet of things (3.4k), big data (4.5k), sports (5.2k), real estate (5.8k), and fintech (10.4k). Furthermore, though drones and Bitcoin have received substantial hype and funding, the number of esports and gaming startups is 4x the amount of drones industry startups and 2x the amount of Bitcoin startups. While a lack of understanding and knowledge of this emerging space may therefore justify the hesitation that many VCs and angel investors continue to have, the concern relating deal flow is misguided. Build and leverage your personal network: Quality deal flow is available, but at this stage it does take a significant amount of work to find. As is often the case in startup investing, your access to deals is heavily reliant on your personal network. Network, listen, learn, and make sure you never "talk down" to the increasingly influential world of competitive gaming. As an investor, you won't be let into a deal if you don't have a healthy level of respect for the industry, product, and entrepreneur. Game respects game. Founding team: Do they not only have a keen understanding of esports and gaming, but also the business acumen to build and grow? In a young industry, this is unfortunately less common than one would hope. Market Size: Did the team use specific metrics around their total addressable market calculations to show their true addressable market and not the larger esports market? This will quickly distinguish the best founders who take extra effort to define their precise market. Publisher risk: Is the company's growth threatened by the role of the publishers to an inordinate degree? Just because they're at risk doesn't mean you shouldn't invest; however, you can mitigate for this by ensuring a few other things. For example, you can examine whether their growth is reliant on landing a key technology integration (e.g., API) contract with Riot or whether their growth can be stunted overnight if Valve changes a specific rule around competition play. Monetization alignment and focus: Are the entrepreneurs listing over ten potential revenue streams for their business? Too many revenue streams listed may indicate a lack of focus. Hyper-focused entrepreneurs pursuing specific monetization strategies will be rewarded and will win the confidence of their investors. Watch out for "consulting" as a potential revenue stream. This is a red flag. Social media awareness: in esports, entrepreneurs can often place too much emphasis on their followers on social media (Twitter, Twitch, etc) and point to their 20k+ Twitter following as market validation or market traction. As an investor, push back on this because the best founders will know that a social media following is only one part of building a successful, revenue-generating business. When I look at esports and its global traction, I’m immediately reminded of the rise of social media. As users adopted social media, companies like Facebook, Instagram, and Snapchat each saw high traction (globally, just like with esports) but did not come up with effective monetization strategies until further down the road. Today, as you know, these companies are now worth billions. I see this as analogous to the global adoption of esports in that esports currently has an audience of 385 million, yet only generates ~$1 billion in revenue. Therefore, this is why I believe esports is possibly one of the best investment opportunities of the coming decade. From an investment perspective, though esports revolves around competitive gaming, it is ultimately a digital media and entertainment investment opportunity. The challenge and opportunity ahead involves monetizing this user and viewer base, which is still in its incipient stages. 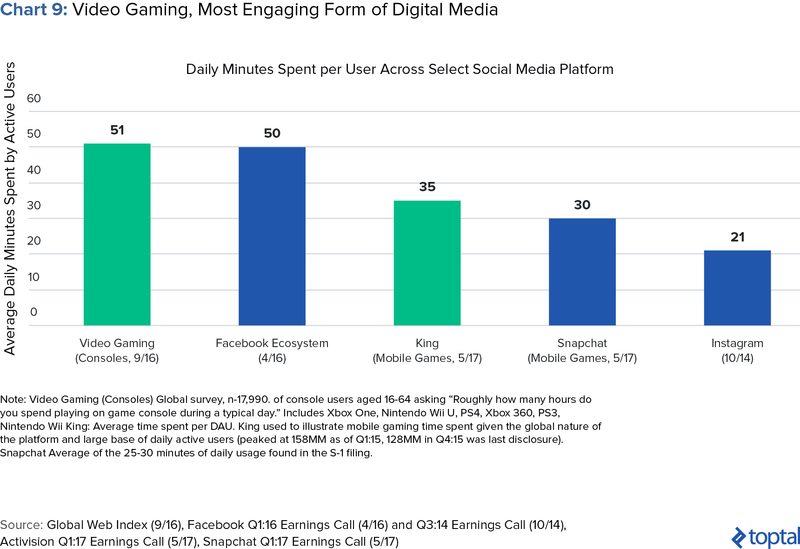 The chart below displays video gaming’s surprising rise over Facebook, Snapchat, and Instagram when it comes to daily minutes spent. The esports industry is the most technologically driven sport the world has ever seen. There’s a strong possibility it will overshadow traditional sports within the next 5-10 years. The only remaining question is: Are you game? Esports includes not only traditional sports-related games like NBA2K, FIFA, and Madden, but also games such as League of Legends, Overwatch, Dota, and CounterStrike. Esports is a new, growing industry where skilled gamers compete at the highest levels for spectators--both in-person and digital. Esports encompasses a variety of games, some more popular than others. Similar to traditional sports, skilled players join teams, organizations and leagues. Yes, gaming is now becoming a sport in that there are now talented gamers streaming themselves while playing or competing professionally, all for spectators. Great read Josh, coming from a "gaming" background, this was a great topic to cover! As Bitedge said - great article and high quality. Thanks.